This month's DVD giveaway from NCircle Entertainment features two shows that I had never heard of. I thought they both sounded interesting and would be good for my four- and six-year-old to watch. Join Mily, a funny and inquisitive 8-year-old girl, as she embarks on adventures hoping to answer the many questions she has about life, people, and the world. In this collection of twenty four episodes, join Mily and her friends as they investigate everyday situations from learning how to deal with fear to playing by the rules to using your imagination and so much more. Whenever a particular situation raises a question worthy of examination, Mily is immediately on the case! From one episode to the next, through everyday situations, Mily introduces young viewers to the art of questioning in order to further develop an inquisitive mind. It s time to learn phonics skills with Twiki and Twini! In this collection of twenty six episodes, Twiki and Twini will take us on fun and educational adventures to discover new words and new sounds. In each episode, Twiki and Twini encounter different objects themed together such as animals, trucks, and more! As each object is presented in the episode, your little one will then watch as Twiki and Twini spell the word out phonetically in fun, illustrative letters that resemble the word being spelled out with their friends. For instance, when spelling out chicken the letters resemble a chicken with its feathers and legs. Each adventure continues with a total of four to five words being spelled out in each episode. In this Season 1 collection, your little one will learn how to spell colors like red and blue to food words like fruit to animal words like snake . The fun and learning never end with Twiki and Twini! Get ready to enter into an unexpected universe comprised of sounds, words, and images. My four-year-old daughter and I enjoyed watching Mily Miss Questions together. The DVD features 24 episodes, but they're each pretty short. In each episode, Mily explores topics like being scared, tomboys, falling in love and wanting vs needing something. Even though some of the topics discussed can be somewhat difficult to explain, they're done pretty well and I thought the episodes were kind of funny. My daughter will be starting Pre-K this fall. She doesn't know how to read yet, but I definitely think Kiwi will help her get better and word recognition and letter sounds. 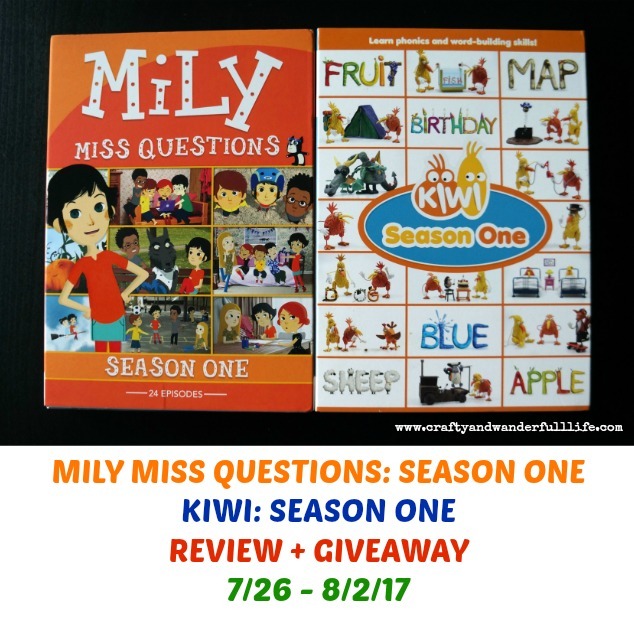 NCircle Entertainment is giving away one (1) copy each of Mily Miss Questions and Kiwi to one lucky reader. Enter using the widget below. Giveaway ends at 11:59 PM EST on August 2, 2017. Open to US and Canadian residents. Good luck! Wanting vs needing something is definitely one of the hardest things to explain to kids. All they know is what they want at the time! Death of a loved one or a pet can be a very difficult conversation to have with children.